It was overcast and cold this morning but we wanted to go check out the Tesuque Pueblo flea market that we had heard about. Eight miles north of Santa Fe, the flea market is open Friday, Saturday, and Sunday, Spring through Fall. In fact it just opened for the season last weekend. When we arrived about 10am we discovered very few vendors open for business and very few shoppers. We had read good things about the flea market where local painters, sculptors, and Native American jewelers, and clothing designers sell their wares. I guess the recent cold temps have resulted in a slow start to the season. We didn't stay very long, but long enough for me to buy a turqouise pendant from a very appreciative vendor. No photography is allowed on the premises, so no pictures. Our next stop was the Georgia O'keeffe Museum . Georgia O'keeffe (1887-1986) is one of our favorite modern day painters and lived for many years in Northern New Mexico at her Ghost Ranch house and her house at Abiquiu. Many of her famous paintings were inspired by the beautiful landscapes and vistas in that area. Also on display today was an exhibit by another New Mexico artist, Marsden Hartley (1877-1943). We learned he lived here in the early 20th century and stopped painting pictures of New Mexico five years before Georgia O'Keeffe began painting it. This was our second visit to the museum and once again, we throughly enjoyed it. Again, no photographs allowed. Now it was time for lunch. 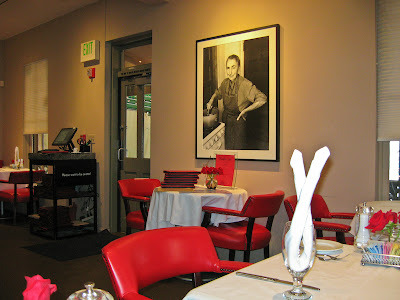 We went next door to the O'keeffe Cafe that features dishes from a European chef . We had "blunch" as they called it. We each had eggs benedict made with lump crab meat. The food and atmosphere were excellent. 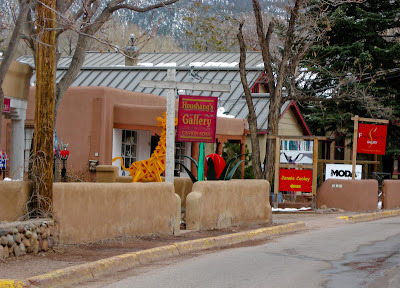 After visiting a couple of photographic galleries we drove down Canyon Road, known for it's many artist galleries and historic adobe houses that line both sides of the street. We didn't stop and look around. 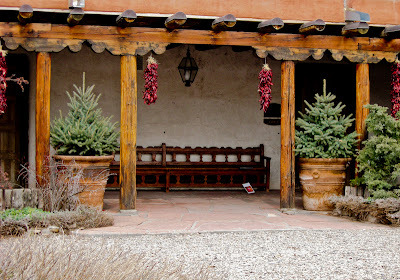 So much to see and do here in the Santa Fe area. We'll just have to come back. the colors in your photos are quite striking...the southwest is so beautiful, isn't it?